Don't Smoke Smoking is the single most preventable cause of death in the United States. If you’re a woman who smokes, your risks of developing heart disease and cancer go way, way up, especially if you use oral contraceptives. Watch out for second–hand smoke, too. Constant exposure to tobacco smoke at work or at home also increases your risks. High blood cholesterol is a major risk factor for heart disease and indirectly increases your risk of stroke. By virtue of being a woman, starting at age 55 your cholesterol is bound to be higher than men’s. Try to maintain a low–fat diet, and when you do use oil, make it olive. It’s a matter of health, not vanity. Women have an increased risk of developing high blood pressure if they are 20 pounds or more above their recommended weight. What’s more, if you have too much fat, particularly around the waist area, you are at a higher risk for a number of additional health problems, such as diabetes, heart disease and stroke. Avoid overloading on carbohydrates, sweets, and fatty foods. Diets high in fat have been linked to increased risk of various cancers. Studies of populations in countries consuming high–fat diets have consistently shown higher incidence and mortality rates for breast and colon cancer. Dietary recommendations are to decrease total fat intake to 30 per cent of calories. Major sources of fat in the Indian diet are butter or ghee, cooking oils or butter, and salad oils, as well as the fat in meats and whole milk dairy products. If you must use oil, make it olive. A diet rich in vegetables and fruits has been linked to lower cholesterol. Some studies also suggest a link between eating particular types of vegetables and reduced cancer risks. Rather than waste time deciding which vegetables to eat to fight a specific disease, focus on eating a variety of fresh produce. Leafy greens, yellow squash, carrots, tomatoes, garlic and onions. They’re all good for you. Be adventurous and select a new type of vegetable every time you go to the market. Dietary recommendations call for at least 5 servings of fruits and vegetables each day. It’s important for your body to relax. You can do so any number of ways. Meditation, deep breathing, even reading can all provide ways for you to take it easy. Better yet, take a pleasant walk and you’ll shed pounds along with stress. Any form of exercise can help you to lead a healthier, and even more productive life. Recent studies suggest that even simple changes in your daily routine can lead to lasting health benefits. So if you’re just not up to sweating it out at the gym, try parking on the far end of the lot and walking the extra distance to work or to the store, taking stairs instead of elevators, or just playing tag with your kids. What’s important is that whenever a choice presents itself, you opt to keep moving. Pap smears can detect pre–cancerous changes in the cervix at an early stage. Treatment of these conditions can prevent the development of invasive cervical cancer. Many times, blood pressure checks are offered free of charge at community health fairs and even local supermarkets. Since high blood pressure is frequently unaccompanied by any physical symptoms, you could have it and not even know it. The higher your blood pressure, the greater your risk for heart disease. 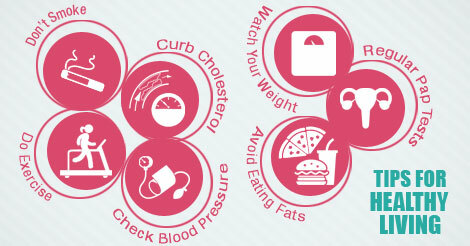 Talk to your doctor to discuss the steps you should take to keep your blood pressure at a healthy level. By a doctor or nurse and ask your doctor when you should begin getting regular mammograms. Early detection is your best defense against breast cancer.